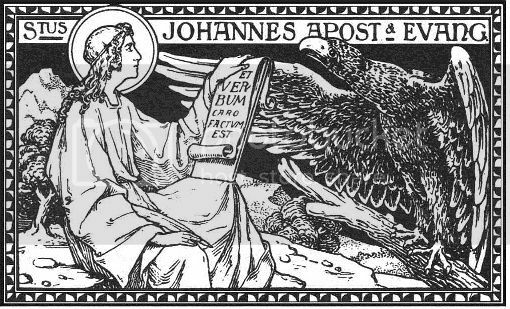 Today is the feast of St John the Apostle and Evangelist. Yes, the source is the Gospels, but the good old Catholic Encyclopædia will tell you something of St John in more condensed form here. St John the Evangelist was honored on December 27. His feast was a general holiday, being kept as the third day of Christmas. Special wine, called St John's Love, was blessed on St John's Day, the formula for the blessing being found in the Rituale Romanum. It was thought that St John had survived the drinking of poisoned wine. Those going on a long journey fortified themselves from harm by drinking St John's wine, and at weddings it was regularly drunk. Often those about to depart this life were given a sip to strengthen them for their departure from this world. In St John's Gospel, Christ is called the Light of the World, and so when lighting the Christmas tree, a child with the name of John is often given the privilege of lighting the tree. That's from an old number - about 10 years ago - of The Wanderer. The original link no longer links to the original story and I'm not finding it in the archive (which you'd probably have to subscribe to anyway). But if you want to have a go yourself you can start here. R. Who made both heaven and earth. Bless + and consecrate, + O Lord God, this chalice of wine (or any other beverage - et cujuslibet potus)through the merits of St John, Apostle and Evangelist. Bestow benediction and protection upon all who drink of this cup. For as the blessed John partook of the poisoned potion without any hurt, so may all who on this day drink of the blessed wine to the honor of St John, by him be freed from poisoning and similar harmful things. And as they offer themselves soul and body to thee, O Lord God, give them absolution and pardon. Through Christ our Lord. R. Amen. Bless, + O Lord, this draught that it be a helpful medicine to all who drink it; and grant by thy grace that all who taste thereof may enjoy bodily and spiritual health in calling upon they holy name. Through Christ our Lord, R. Amen. May the blessing of almighty God, Father, Son, + and Holy Ghost come upon this wine and remain constantly. R. Amen.